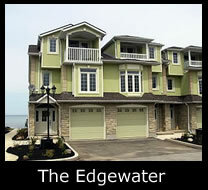 The Edgewater, Blue Mountains – Craigleith is a development of 16 exclusive waterfront real estate townhouse condominiums on Georgian Bay, providing accessibility to an active lifestyle. The Edgewater units have views of Georgian Bay and Blue Mountains and a private beach. Amenities: Waterfront real estate, private beach, garages, gas fireplaces, deck/patio, central air, central vac, cathedral ceiling, in-ground sprinklers, landscaping, snow removal.